Squirrels and rabbits are hard to miss around the woods, but the more discerning observer may catch a glimpse of a Polecat or a Fox. 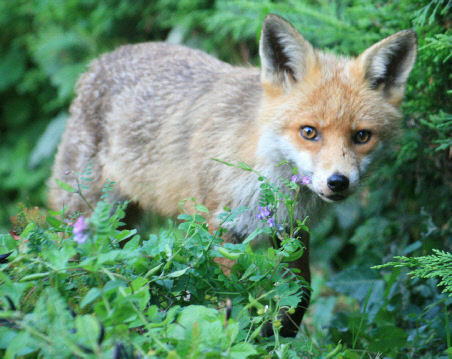 Most of our mammals are active at night but we can sometimes catch them on early mornings or at dusk. 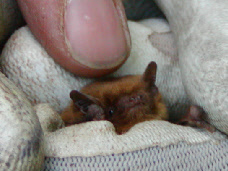 The habitats of the woodland are used as home and foraging grounds to many species of bat. 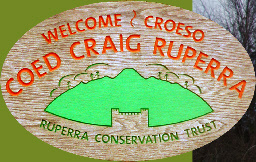 The efforts of Ruperra volunteers and the Valleys Bat Group have revealed that common species at Ruperra include Daubentons, Noctule, Brown Long-eared, Whiskered/Brandts and Common and Soprano Pipistrelle. 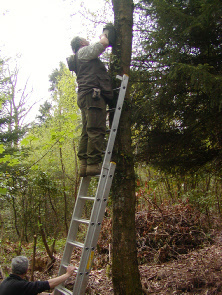 There are bat boxes on some of the larger trees, which are checked twice a year; you need a head for heights for these surveys! Not all bats will use boxes, as some of them have different requirements and prefer caves, or buildings such as old barns, but we do find Pipistrelles in our boxes. Nearby, old buildings support a maternity colony of Greater Horseshoe Bats which regularly pass through the woods on their way to their foraging grounds in the local area. Horseshoe bats (Rhinolophidae) are rare in the UK with Lesser Horseshoes confined to Wales, western England and western Ireland and Greater Horseshoe confined to South Wales and southwest England. 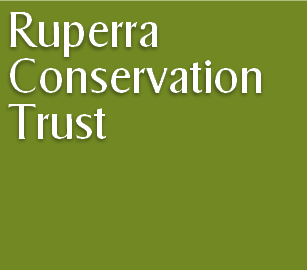 Every summer, the volunteers of Ruperra lead monthly guided bat walks, and on these you can learn to indentify some of the different species with the help of electronic bat detectors. For more details see our events page. The large dark eyes of the tiny Hazel or Common Dormouse are an indication that this is a nocturnal creature. Most people nowadays are unlikely to see one except on the television or in photos. The reasons behind this are simple. Firstly, they are an increasingly rare species, due to loss of their favourite habitat, which is Hazel woodland with plenty of connecting branches between trees, or hedgerows which allow them to travel safely along feeding routes. Secondly, they are, as mentioned, nocturnal; this means that they come out at night to forage for the nuts, berries, seeds and insects which form their diet. Finally, they are arboreal, preferring to travel off-ground via branches and foliage; they avoid being on the ground whenever possible, probably because this is where they are most vulnerable to predation by owls and larger mammals. All of this makes the Dormouse a rare sight. However, where their presence has been detected in favourable woodlands such as Coed Craig Ruperra, their numbers can be monitored by providing them with nest boxes. In these, they will happily make a small nest woven out of honeysuckle bark or similar materials, topped with fresh leaves taken from the canopy above. Sometimes the nest is simply a looser overnight ‘motel’ which the animal will use occasionally while travelling round its foraging area. However, the females will make a more substantial woven nest in which they have their family of up to six or seven babies. Dormice are not territorial, and when we check the nestboxes on our monthly surveys, we often find two or even three happily occupying the same box. 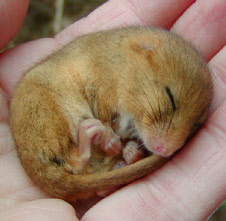 The Dormouse gets its name from the French verb, ‘dormir’ which means ‘to sleep’. One of its old country names was ‘Seven-Sleeper’; this reflects its habit of sleeping during the day in summer and also hibernating through the winter. That effectively means it is asleep for virtually seven months of the year! It is one of only a few animals in Britain that hibernate (others include Hedgehogs,all bat species and amphibians and reptiles such as Slow Worms, Toads and Frogs). 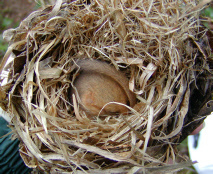 However, the Dormouse snoozing in its nest on a summer day is not just asleep as we know it. Like bats, the Dormouse feeds at night, then goes into what is called ‘torpor’. This is a very deep sleep, more like a comatose state, from which the tiny animal wakes only slowly, and it is then that it is most at risk from predators. The benefit for us is that when we survey our nestboxes, a Dormouse that is in torpor can be weighed, sexed and replaced in its box without even waking up – which is why we have some great photos of them! Dormice are, however, a protected species. 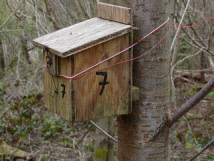 It is against the law to disturb them or their nests without a licence, so if you do see a nestbox on your walk around our woodland or anywhere else, please stay well away from it!